You may have heard or already encountered the new USB plug, called USB-C. At the same time, you may be less familiar with the Thunderbolt 3 (T3), a plug that looks exactly the same. Here we will outline the differences between them. Universal Serial Bus (USB) is a standard introduced 20 years ago intended to simplify and improve the connections between computers and accessories. 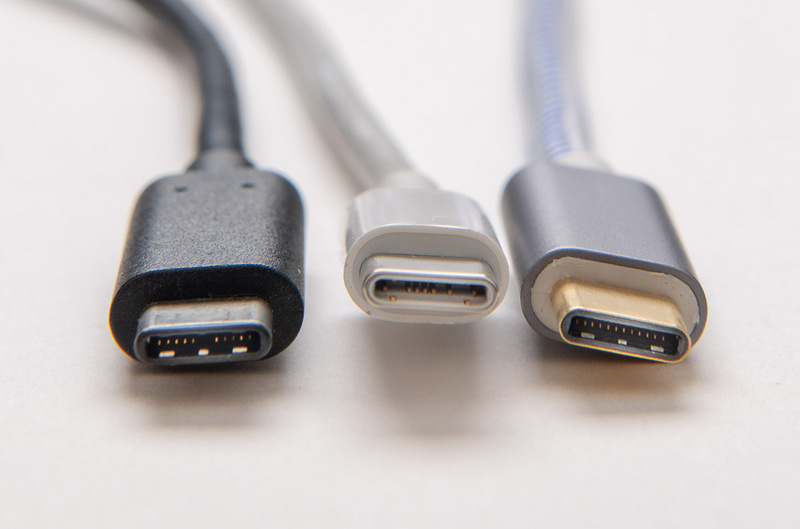 USB-C is the new standard for USB, and more and more devices will feature it. All of Apple’s desktops feature USB-C and the new laptops only have USB-C type connecters. It is currently not as prevalent on PC desktops, but Windows laptops are featuring it more and more. Which one is the real Thunderbolt 3? At the same time, these new devices may not be Thunderbolt 3 enabled. T3 and USB-C share the same physical connector, so it is easy to be confused. Just because the physical connection looks the same does not mean it will work in the same way; it depends on the device and the data controller at the point of connection. You may get a “device not supported” error message when you plug a T3 into a USB-C. Some manufacturers are good about identifying the connection type, and others not so much. It has a symmetrical connection, so it doesn’t matter which way the plug is facing when you insert it. This allows you to daisy-chain up to six devices. 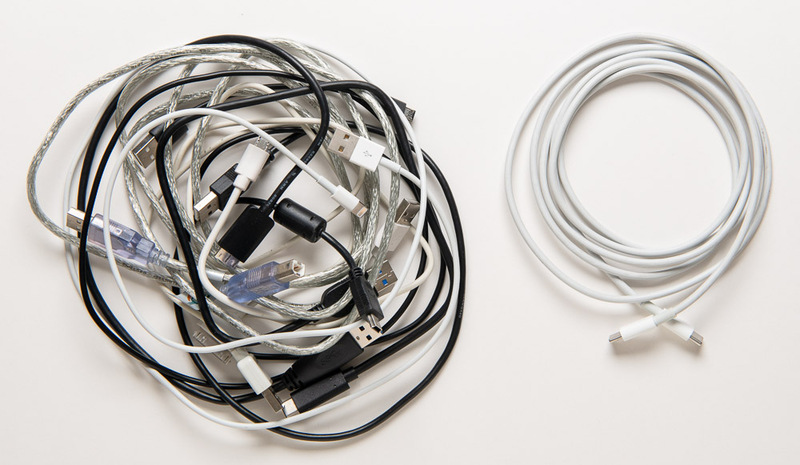 USB C could reduce cable clutter. From the perspective of the casual end-user, there are a few key things you need to know. Going forward, you should pay attention to the whether the devices you purchase have USB-C or T3 connectors and be aware of these features and differences. For your existing devices, the good news is that USB-C is backwards compatible, so, as long as you have an adapter for your device, the data connection will be seamless and you will connect error-message free. There is no harm to your computer or accessories if you plug a T3 into a USB-C, as the smart data controller will make sure nothing bad happens. Hopefully, the new USB-C style connector will help reduce the number of different cables you need to keep on hand. 6-8PM The first Wednesday of every other month - New location to be announced This is for everyone and all levels of experience. Past guests include Adobe Lightroom Evangelist, Terry White and noted author, Katrin Eismann, Join us! Copyright © 2019D.A.Wagner. All Rights Reserved. All text, photographs and videos appearing on this website are Copyright © D.A.Wagner unless otherwise noted and cannot be used without the express written permission of D.A.Wagner. Adobe® Photoshop® Lightroom® are registered trademarks or trademarks of Adobe Systems Incorporated in the United States and/or other countries. Lightroom Guy is not affiliated with Adobe in any way, nor does he represent their views. He just likes Lightroom. A lot. Produced by Tadpole Collective · Powered by WordPress.